Willows have a reputation for being difficult to identify, and for extensive "hybridization", but it is mostly not their fault, at least below an elevation of ~6000 feet in coastal southern California. In this area, including all of Orange County (Roberts 1998) and all of San Diego County (Rebman and Simpson 2006), we have only five species, and they are very easy to distinguish. Furthermore, you are unlikely to ever run across a hybrid. There are 30 distinct taxa in all of California, 27 native species, one of which has two subspecies, and 2 non-native species. Some of these are indeed distinguished only by fairly subtle features. The fairly subtle features are almost always found in the flowers, which are only present in the dead of winter for most species, a time when many botanists are busy doing other things like keeping warm or recovering from the holidays. Most botanists come across willows only long after they have dispersed their seeds, making it impossible to distinguish some species. Willows are tall shrubs and trees, and many botanists expect to usually be able to identify a tree by its leaves alone. Since this is impossible for all 30 taxa, botanists feel frustrated by the genus. In coastal southern California below 6000 feet, botanists have been, shall we say, a bit overenthusiastic in defining taxa. Munz (1974) contains entries for 12 different taxa for this region, with another taxa mentioned in one of those entries, for a total of 13 taxa grouped into 6 species. Unfortunately for botanists trying to key out willows, the majority of these "taxa" are spurious. The distinguishing features for the 8 spurious taxa were based on the hairiness, shape and margin characteristics of the leaves, as well as the hairiness of the ovaries and length of the stigmas and styles. Those characteristics vary tremendously in our willows, and they aren't perfectly correlated. Hence although one could find clear examples of the spurious taxa, one could also find plenty of specimens that had the "wrong" combination of properties, which then had to be interpreted as "hybrids" between the defined taxa. Fortunately, George Argus, in the 1993 Jepson Manual treatment of Salix, subsumed the spurious taxa into 5 clearly-distinguishable taxa in coastal southern California. In one stroke, he thereby eliminated the difficulties in keying these species from their leaves and eliminated the vast majority of the putative hybrids. We've keyed out literally hundreds of willows, possibly thousands, using his species delineations and have found exactly one specimen that seems to be a hybrid. However, the Jepson Manual treatment has to distinguish all 30 taxa in all of California, so this great leap forward in willow identification hasn't been properly appreciated by many botanists in our region. Most botanists in southern California thus never realize how easy it is to distinguish our 5 taxa, simply since they don't have a key to easily do so. The purpose of this page is to present that key. The key presented here is a vegetative key, based on leaves and leaf buds, that can be used at nearly any time of year, often even with leaves you find on the ground when the plants are leafless. Actually, once you learn our five species, you won't need the key. You will be able to glance at the twigs and leaves and identify the species immediately, and willows will soon become quite boring from the identification viewpoint. The key is presented in two ways: first, the usual word key, and second, by using pictures. The easiest way to distinguish the Baccharis is to look for flowers that are not catkins, fresh or dried, at the tips of the stems. Mule fat will nearly always either be in bloom or have persistent dried flowers which are clearly in terminal clusters. The flowers or remnants can easily be seen to be those of the Asteraceae, sunflower family, but you don't have to categorize them; all you have to do is find terminal flowers. In contrast, willows have blooms that are catkins, a tight cluster of naked stamens or pistils, one to each leaf axil, that leave little evidence of their existence after they drop off. 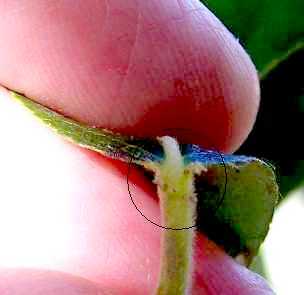 Another method is to look at the veins in the leaves, best seen on the underneath of the leaf. Willows have one main vein down the center of the leaf whereas mule fat has two additional veins running from the base of the leaf along the outer edge of the leaf. Both have additional shorter veins in a feather pattern branching from the central vein. There are two other clues that distinguish mule fat from willows, but they are not definitive in separating them like the flower test. First, mule fat leaves tend to be sticky, whereas willow leaves tend not to be sticky. Second, the leaves of mule fat have almost no petiole (leaf stalk), whereas most (but not all) of our willows have an obvious petiole (only narrowleaf willow does not). There is another plant with willow-like leaves on the desert side of the mountains, desert-willow, Chilopsis linearis ssp. arcuata, but is almost never found on the coastal side of the mountains, and hence won't be discussed here. Flowers quickly distinguish this species as well. Remember, this is a key to coastal southern California willows below 6000 feet; if you venture above 6000 feet outside of San Diego County, you may find additional species and therefore this key will not apply. However, if you are botanizing in San Diego County, these five species are the only ones in the entire county, which has a maximum elevation of 6533 feet at Hot Springs Mountain. The above numbers will be representative for vouchers for all of coastal southern California below 6000 feet, since these are widespread species. The abundance of the very common S. lasiolepis is underestimated in the above table since such common species are not vouchered in representative numbers. For more information, and links to more pictures, see Willow Primer for the San Gabriel Mountains. Go through this key from top to bottom IN ORDER, and go to the next entry if the previous ones don't find a match. You must go through the key exactly in this order for the first two steps, since the leaves of Salix exigua are variably-colored on the underneath. You need mature leaves for the key, since young leaves are often quite different in shape, color and appearance from mature leaves. You need typical leaves for the key, since willows, like many plants, have no legally-binding contracts to produce identical leaves in all cases. 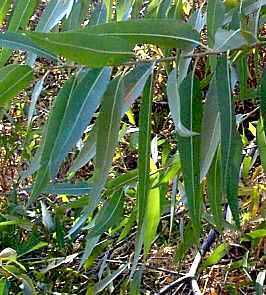 In particular, red willows, S. laevigata, almost always produce a few leaves that are close in shape to those of arroyo willows, S. lasiolepis. These are almost always the first leaves of the season, before it gets better at making its typical leaves. Such specimens are not in general hybrids; this is simply what red willows do, which is probably another source of the belief that willows commonly hybridize. See the pictures in the next key below to see examples of the traits being discussed. Step 1: Is the leaf at least 10 x longer than wide? If so, you have found S. exigua, sandbar or narrowleaf willow. If not, go to Step 2. If you are a beginner, don't guess at this ratio; carry along a ruler marked in mm and measure the length and width of a typical mature leaf. Measure the width at the widest point. You will typically get a measurement something like 60 mm long and 6 mm wide, for a ratio of 60 / 6 = 10 for S. exigua. (The leaf length can vary from 50 to 130 mm for this species.) Note that young leaves have a ratio of ~5. All leaves except the very longest will be narrower than 1 cm, the width of the fingernail on your pinky. The leaves can be green or whitish on their lower side, so pay no attention to that; only pay attention to the shape of the leaf. S. exigua is not called the sandbar willow for nothing; you are likely to find it growing in sandbars of rivers, or wet seeps in sandy washes in the desert, at all elevations. 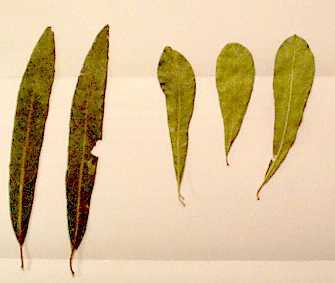 The remaining four species have leaves that are usually significantly wider than 1 cm, and are less than 10 x longer than wide. Step 2: Is the leaf the same color above and below? If so, you have found S. gooddingii, black willow. To test this, turn one leaf over and place it on top of another leaf. No need to agonize here; you'll either immediately see that the two leaves are obviously different or that they are very close in color. S. gooddingii requires a lot of water, and is usually found only along streams with year-round water such as the Santa Margarita River, below ~2000 feet. The remaining three species all have leaves that are whitish (glaucous or silvery-white) on their lower side. Step 3: Is the distal half of the leaf as wide or wider in every portion than the proximal half of the leaf? (The distal portion is closest to the tip of the leaf, farthest from the stem; the proximal portion is closest to the stem.) If so, you have found S. lasiolepis, the extremely common arroyo willow. To check this, simply fold the leaf in half along the midpoint of its length, and look at it with the distal half of the leaf nearest you (i.e., on top of the proximal half of the leaf). If the distal half matches or obscures the entire proximal half, it is as wide or wider than the proximal half. If you can see the proximal half, because the distal portion of the leaf is narrower than the proximal part of the leaf, it is not. Again, no need to agonize here, since the other choices have a very narrow tip and it will be obvious if the tip is narrower than the base. S. lasiolepis is our most common willow by far. If you simply guess blindly that you are looking at S. lasiolepis, you'll be right the majority of the time. This is the only willow that grows in the "driest" wet locations such as seasonal drainages, and it grows at all elevations up to 8000 feet and higher. It becomes less abundant along streams with year-round water that favor the other species. Note: above 6000 feet and north of San Diego County, there is another willow species, Scouler's willow, S. scouleriana, that is virtually impossible to separate from S. lasiolepis using the leaf. One has to use flowers to reliably separate these species. In fact, we have been proved wrong on more than one occasion in using just the leaves to predict whether a given specimen would turn out to be S. scouleriana or S. lasiolepis. See Big Horn Mine Trail and Devils Slide Trail for two examples where we have been surprised at the actual determination. Step 4: We are now down to only two species, both of which have most leaves with a distal half narrower than the leaf proximal half, usually due to a tapered sharp-ish tip: S. laevigata, red willow; and S. lucida var. lasiandra, shining willow. Distinguishing these two is the only possibly tricky part for a beginner. There are two ways to distinguish them. It will almost always be possible to find one of these characteristics to get the determination, but both are not always available. The buds in the axils of the upper leaves are obviously sharply-pointed for S. laevigata, and obviously round-tipped for S. lucida. This is the easiest test and most reliable by far. These buds are set soon after leaf development, and hence are available nearly all of the year except when the willows are leafing out in spring. 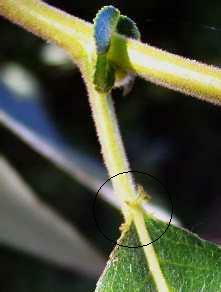 The leaf stalk (petiole) has "bumps" (glands) on it for S. lucida, but is smooth (bump-less) for S. laevigata. See the pictures below. Unfortunately, the bumps are not always present on all leaves at all times of the year, so you need to check several leaves, preferably of different "ages". Also, as with many plant characteristics, until you've seen this in person, you aren't exactly sure what you are looking for. Use whichever way works best for you. S. laevigata is far more abundant than S. lucida. Both grow along streams with year-round water, and are much-less-commonly found in seasonal drainages. Also see Print Version of just the key itself. We will get better pictures of the buds and leaf bases for S. laevigata the next time we see a specimen.